So I am going to apologize in advance, if you are annoyed because EVERYONE and their mother are starting up a foodie blog. I guess I was always late for jumping on the latest trends. When I was growing up, I was the last student in my class to get a cell phone (I was a junior in High School). Our family never had cable TV, or even high speed internet growing up. And I am sorry to say, I first listened to “What Does the Fox Say” about two months after it became popular. Needles to say that I am usually late on the trends. So why is this twenty-something starting up a cooking blog just like everyone else? Well today was a blustery, snowy day in northwestern Wisconsin. Like any other frigid day, I decided to whip up some soup to eat by my fire. I started scanning Pintrest, like I do every other day. I remembered a can of artichokes I had in my food pantry FOREVER. “I wonder if I can create a soup with artichokes in it” I thought to myself. The kettle came out, cans were cracked open, and I started cooking up a storm. In the process of making this soup I thought of all the times I cooked, created an amazing recipe and failed to write it down. Later I would go back and try to remember everything I threw into a recipe…Sometimes I would succeed…Other times I would fail. Today was different. I was going to finally write down what I was doing, so that later I could actually remember what I was doing. 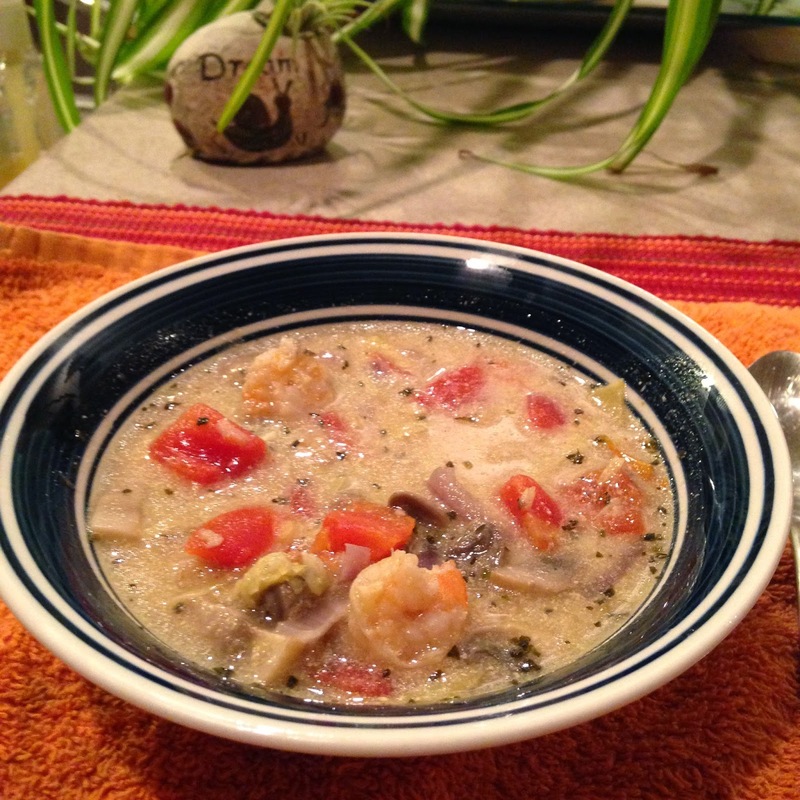 Here’s the recipe from today’s Shrimp Tomato Artichoke Soup. Saute onion in olive oil for 2 minutes. Add Garlic and mushrooms and continue to cook until the onions are slightly browned. Drain/rinse tomatoes and artichokes and add to the base. On low heat, add stock and half and half to the base. Allow soup to cook until it starts to boil. Defrost and peel the frozen shrimp while waiting for the mixture to boil. Once the soup is boiling, add shrimp, cayenne pepper, salt and pepper to your soup. Allow soup to continue to simmer for 5 minutes.